I’ve already carried you through some basic stuff you need to know before you start dealing with sewing in the first place! But, there are always some interesting facts and I’ve thought to catch up some things I’ve missed and considered interesting for you future sewing people! Here’s the deal! What people are mostly confused about is what types of materials are there and which to choose! Is there a big difference between viscose and polyester? Which one is better? I’ve taken out the most commonly asked questions during the research I’ve carried out and here are your answers! Knowing that sewing is back to business a past few years, I believe you’ll find these answer useful in many ways! Both sewing and serger machines are great. But what’s most confusing to non – professional seamstress is – what’s the difference between these two? Serger machine does several things at the same time. Not only it sews and makes stitches but it also cuts the edges of the fiber you are using simultaneously! Serger machines use several cones of thread at the same time and on the same machine. This is something ordinary sewing machine can’t support! But, although serger machines can perform edge sewing perfectly, there are many projects they can’t do. A sewing machine is something absolutely necessary if you want to sew, and serger machine is a nice professional adding. After hours of discussions, we are all aware that sewing machines are necessary if you want to sew. Special machines sure make your life and job easier because of all the special functions they have. The one thing we need to be aware of is that they have limited function and keep that in mind! What can you do with a serger sewing machine? When you buy a new piece of clothes, turn it upside – down! You’ll see how perfect the seam is and that there aren’t some extra long pieces of fiber next to the edge of the seam. This is done by using a serger machine! That’s what it makes it great! You can sew your clothes and make them look professionally – like it just came out of the store! Besides this great advantage of doing a couple of things at the same time, the way this machine looks will already make you feel like a professional! Also, after sewing a stitch on a regular sewing machine you have to cut the edges of the fiber by yourselves – which is something you don’t do (as I’ve mentioned) when you use serger sewing machine! This multiple –thread – using provides more quality and longer lasting stitches. It is also useful in fighting against wearing out! And, of course – serger machines are fast! They can sew up to 1600 – 1700 stitches per minute! Wow, how cool, don’t you agree?! Of course, I don’t think sewing machines are bad. You can place them easily in your room; you can use them for hemming knits or even for narrow rolled hems. It’s easier to start with sewing machines because it will give you more freedom and make you feel relaxed because you won’t feel stressed like I felt when I first sat down to use serger machine. Both machines can do wonderful things so I leave up to you to decide which one suits you better! If you are a beginner, and you’ve never sewed before, choose sewing one! Both of these machines, serger and overlock are machines that have serge functions. People sometimes get confused thinking there are more types but there aren’t. It happens to people to mistakenly replace brand name for a type of machine! When it comes to serger performing machines this happens very often with Baby Lock machines. This is not a special type of machine; it’s a brand’s name! Keep this piece of information in mind, especially if you are new in this field! Even though both, serger and overlock machines make perfect stitches, cut the fiber and make different types of stitches, these machines are not the same. They are both great but differ technically! What’s the same? What’s different? – Let’s see! Both types have two needles, support more than one spool of thread. They also have a longer foot and a needle plate than sewing machines. What’s different is that overlock machines (as the name says) make overlock stitches. When it comes to decorative stitches, overlock machines support fewer spools of thread so you can’t experiment too much with this – what you see is what you get! Some overlock machines can perform cover stich. If you want to sew on some trims or lace the cover stitch is what you need. When you come to bump into a folded area, a cover stitch is your solution. These stitches are something that regular serge machine doesn’t do! Interesting is that there are particular machines designed for cover stitches. Serger machines (as I’ve already explained) can make stitches and cut the fiber at the same time. Some serger machines support up to eight spools of thread which allows you to play with decorative stitches! Chain stitch as well as flatlock stitch is also something serger machines do perfectly. Special serger machines, which are, of course, more expensive, can make cover stitches. I’ve explained the difference between these two machines briefly. In the fight “serger vs. overlock” there isn’t a winner. Both types are great, it only depends on what you need them for! What can also confuse us (besides what sewing machine serves what purpose) is definitely what types of materials there are and which one serves for what! Lots of wh – questions one would say! As most commonly asked questions from my followers is “What’s the difference between viscose and polyester”? Firstly, both materials, along with nylon, for example, are man-made. They are not natural like cotton but were invented by people. This is one thing they have in common, but there are many differences between them. So let’s cut the chase and get to the point! Polyester (a compound made of polyethylene terephthalate) is a synthetic fiber most often used in the production of sports clothes. This material is great because it is waterproof. By this, I don’t only refer to water outside (like rain) but also sweat and so. If you are working out in a gym, you’ll get sweat. A piece of clothes made of polyester will either act as a barrier or will wick water. Either way (which depends on the tightness of yarns) it will protect you. If you are outside, the great advantage is this barrier thing. If, on the other hand, you are practicing in a gym or jogging and your goal is to get sweat as much as possible, specially designed clothes made of polyester will wick your sweat away. You’ll get the desired effect without catching a cold! One more benefit of this man-made fiber is that it dries quickly. Although viscose is also a man-made fiber, it is not completely synthetic (it contains cellulose). It is opposite to polyester in many ways! Viscose is very comfortable to wear! This fabric absorbs water allowing your skin to breathe. This type of material provides the feeling of comfort, pleasant cold and dryness. This makes clothes made of viscose great to wear even the entire day! It’s great but not perfect. Since it absorbs water, there can be a trouble if you get wet. And it takes time to dry out! There is a great chemical difference between viscose and polyester and because of that you sure won’t wear polyester made underwear or viscose tracksuit! How to choose a sewing machine for quilting? Quilting can be a lot of fun but before you buy a quilting machine you need to check up a few things. First think thoroughly why you want this machine! Is it pure fun or you need it professionally. This is important because of the money you’ll spend on it. If your goal is to learn how to quilt, or you want to have some fun you don’t have to spend God knows how much money on it. These machines can be expensive so the intention is important. After you’ve decided what you need the machine for, take short research on brands. There are many brands and they all have their pros and cons. You can search the internet or ask around with your local dealer. The more information you get, the easier will be to decide! Besides the price and brand, there are some more things you should pay attention to when it comes to quilting machines. Thread cutter: Choose an automatic thread cutter because it will save you a lot of time. Speed control: You get to choose your speed which is essential for beginners who need to work slowly. Needles: If you can choose the machines that finish quilting with the needle down, it will save you time and provide preciseness. There are also differences in presser foot, a knee lift and so. Always choose the components that fit you. It’s the only way not to make a mistake. If you have second thoughts about where to buy, my advice is to buy it in a local shop. Internet sale can save you some money, but unless the machine is new, you can’t be sure of its quality! How to remove rust from sewing machine parts? Rust on sewing machine parts can be real trouble. But every trouble has a solution. Let’s see how to deal with it! Rust mostly appears on the surface of the machine, not inside but can be a real troublemaker because it spreads! For dealing with it you’ll need a couple of things: a few brushes (small and medium), small wire brush wheel, a cordless rotary Dremel and a sanding sponge. First, take the sponge to remove the first layer of the rust. Then you take a brush wheel. If you come upon some stubborn stains Dremel and metal brush will be very helpful. Both steps should be taken carefully, with paying attention not to damage anything. Sand sponge can’t be the problem here, but be careful with metal brushes. Honestly, it never happened to me to damage anything but nevertheless – you can never be too precocious. There are other ways, such as using special types of oil, heated, or (as some suggest) vinegar but I didn’t find these solutions much helpful. The first because it disturbed my breathing and the second because it didn’t help. When I first started sewing, there were things that really confused me. One of them was definitely stay stitching. This thing was jumping everywhere but I didn’t know what it was. So I did my own research and decided to present it to you as clearly as possible. Stay stitching is a single line of stitching placed to keep the fabric firmly to get a straight line. It is done through only one layer of fabric. Now, when you know what it is, you see it’s very important. Stay stitching will help you avoid any mess or disorder while sewing lines. It is used on the edges that have a bias cut. Stay stitching should be done in one direction (directional stitching) or otherwise it causes a complete mess! 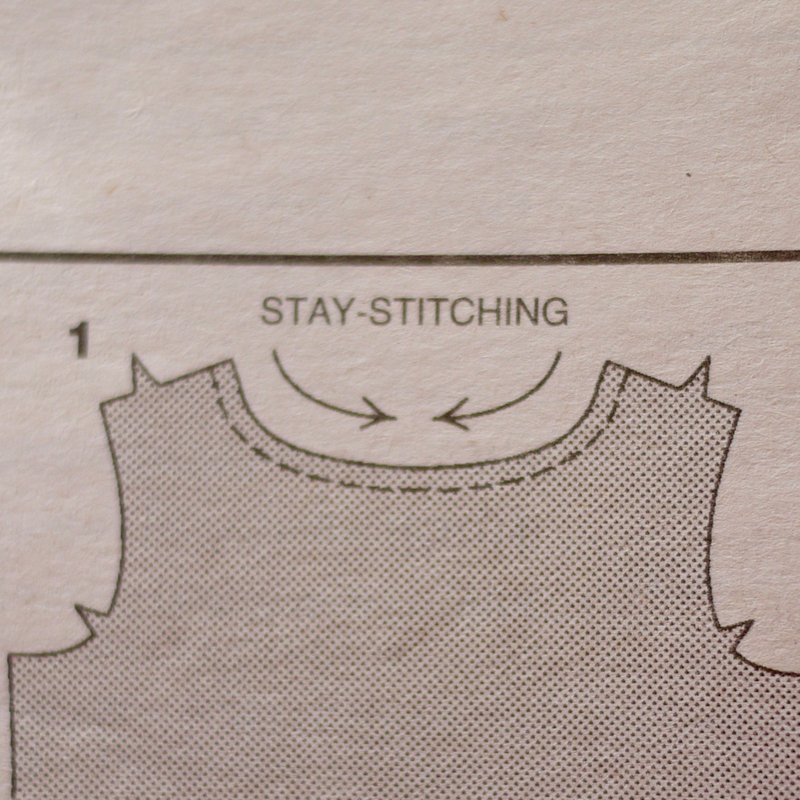 If some pattern requires to stay stitching, make sure you don’t miss this step. Believe me, I’ve tried thinking it’s completely unimportant and irrelevant, but I was wrong! It is maybe a step or few more but it can be very helpful later. People mostly think it’s a waste of time since it’s done on only one layer but you’ll see it’s very helpful later when you are joining two layers! You may even lose the shape later. It’s not necessary to do stay stitching always, but, if you want to sew something that requires this step, make sure you don’t miss it! How to fix the sewing machine tension knob? Tension working properly on your sewing machine is a must! This thing you have to take care of properly if you want your sewing machine to work the way it should! Tension is what secures equal stitches looking the same on both sides. If you sew and notice that your stitches aren’t the same on both sides it’s probably because there’s something wrong with your tension! But, if your stitches are fine and equal, don’t touch the tension! Top thread and bottom thread need to be equal. It can be very tricky to decide which one is not ok.
You need to do the checking but very carefully and using some piece of fabric you don’t need. Never use the project you’re working on! You can check it out by using, for example, different colors of thread. This way you’ll easily discover which one isn’t good. What’s most probable cause of the problem is that you either need to tighten or loosen one thread, or even both! Every sewing machine comes with the manual, so before you start doing anything, check every possible advice you can get out of it! One more possible problem is a tension knob. With this, you have to be extra careful because once you break it you have to replace it. To remove it, push in the number dial and turn it counterclockwise. There is a little cut on the back of the number dial right at zero. This will be positioned slightly on the left. Take it apart, piece by piece and check if something is possibly wrong. If you can’t tell for sure ask an adequate person. If it happens that your knob keeps falling out of the machine, you need some new parts. If you take your tension apart and it’s still not working properly, contact the manufacturer support and if they can’t help you contact a local repairman. An important part of the sewing process but the sewing itself is bobbin winding. Without knowing how to do it you won’t sew at all! 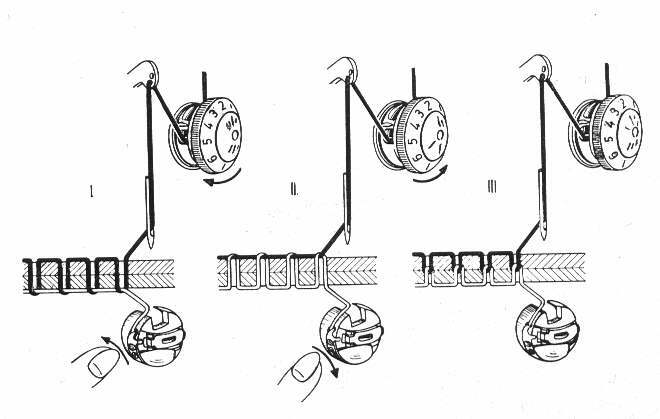 This process refers to winding the thread onto the bobbin and loading it into the right place. Wind the bobbin before you thread the machine and the needle. Now let’s see how to do it! Remember the first rule! Winding the bobbin is very easy if you follow a couple of steps. That’s it. A piece of cake. This is very important but also a very simple thing to do. Follow the steps I wrote and you won’t make mistakes! Where are Janome sewing machines made? This company has factories in Taiwan, Thailand and of course Japan. The factory was founded in 1921 and today’s name was established in 1935. They sell their machines all over the world and are especially popular in America. This was the first company that produced computerized sewing machines for home use. They also produced the first embroidery machine for home use with professional style. And inevitable – they first produced a long – arm quilting machine for home use! The name “Janome” means snake’s eye. This refers to round bobbin because they’ve used it from the establishment (as it was more advanced technology). Since it resembled a snake’s eye, the establishers decided to give the company such a name. Sure there are more doubts and questions than mentioned here but I’ve extracted the most common questions and probably most confusing details. This article was meant to give the most concise answers to anyone who has just started dealing with sewing or has already been working for a while but hasn’t understood it all! Hope you’ve found my answers helpful! See you in my next article! Where To Find The Best FREE Sewing Patterns Online? Which Marking Tool Should You Use For Your Sewing Projects? How Many Kinds Of Sewing Stitches Are There? The Best Self Healing Cutting Mat: My 2019 Favorites!